How many times have you come across a recipe like the one below for Penne with Artichokes on a food label? A tiny 3″ square with no photo or headnotes, significantly truncated to fit on the box? Recipes like this are kind of mysterious. You have no idea of what the dish looks like or how it tastes and it can be a challenge to decipher the oh-so-brief directions. It was mysterious little on-the-package recipes like these which sparked my interest in starting this blog two years ago. There were so many of them popping up on labels in my pantry, I became very curious to see how they actually came out and hoped to find some hidden gems along the way (which I have). You guys know that when I say food packages I don’t mean “packaged food”, as in mixes and prepared or processed foods, right? Every once in a while someone will indicate to me that they think Cooking On the Side is about cooking with processed foods and I cringe. Yikes, it’s just the opposite! Wherever possible, I like to cook from scratch. For this blog, I look for the recipes that appear on basic ingredients – flour, butter, fresh meats and vegetables, pasta, chocolate and so on. 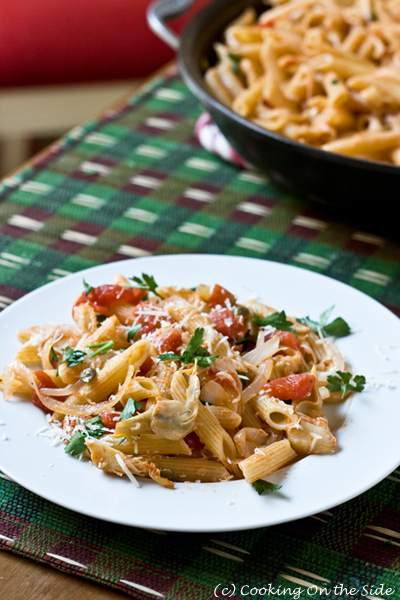 I have found a number of fabulous new recipes in the course of this little endeavor – and today’s easy, flavorful tomato and artichoke pasta dish is one of them. 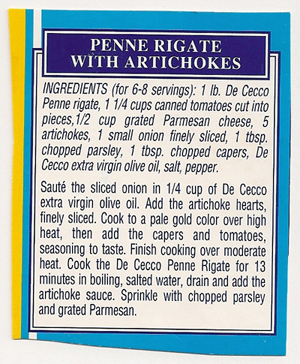 So now you can see what that tiny 3″ square recipe on the back of the De Cecco penne rigate box actually looks like. It’s one of those incredibly simple, homey pasta dishes that will be a perfect addition to your repertoire of quick weeknight dinner options. The recipe left out a few details, such as whether to use fresh or jarred artichoke hearts or how long to simmer the artichoke sauce, so I filled in some of the details as seemed right to me. I’ve seen little recipes like these on each of the different De Cecco boxes – now I’m anxious to try them all. In a skillet over medium-high heat, sauté the sliced onion in the olive oil. Add the artichoke hearts. Cook to a pale gold color over high heat, then add the capers and tomatoes, seasoning to taste. Simmer 15-20 minutes over medium heat. Cook the penne rigate until al dente according to package directions in boiling, salted water. Drain and add to the artichoke sauce. Sprinkle with chopped parsley and grated Parmesan. i bake your chocolate rugelach all the time…it has become a staple in my kitchen…& i have shared the link with my baking friends! I love artichokes, especially in pasta dishes. I can’t wait to try your recipe! When I saw the recipe on the box, I wondered if they were really calling for 5 artichokes or 5 artichoke hearts. You used hearts? (I can’t imagine using whole artichokes, but that’s what it calls for!) Did you use fresh or jarred? See what I mean? Cryptic! In the ingredients list it only said artichokes but in the directions it said artichoke hearts. Thanks for reminding me to change that in this version of the recipe. I went with marinated hearts in a 6 oz jar. Pasta and artichokes seem like a match made in heaven. I love to try those little recipes tucked away on the side of boxes. This looks like a must try! This looks and sounds delicious! Lovely photos, as always. I’ve always wondered about those recipes on the side/back of the pasta boxes! 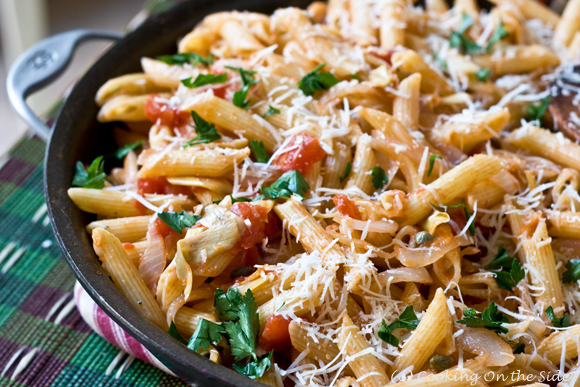 This looks like a wonderful weeknight pasta dish! Yum! This looks wonderful! Wow! 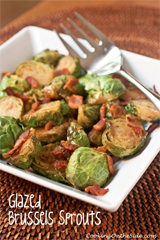 Love this dish and can’t wait to try it! Wow. With such a beautiful dish I wonder why they don’t make it more enticing by placing a picture on their packaging? Thanks for sharing! I love the concept behind your blog and I love that I can finally put pictures to that tiny little 3″ spot! but i did make an artichoke pie sans the crust. this summer i will save this dish to devour. I love the premise behind this blog and always have. It takes the mystery out of those delicious recipes on the sides of boxes. It was so easy…definitely need to make this again. Those sound like fantastic additions, Aaron – thanks so much for sharing them! Yum – this was really great! I made it last night actually, and it turned out very well! I found your blog just a few days ago actually and had planned to make it soon. I’m now checking out some of your other recipes! Meanwhile, this penne with artichokes is going to be a regular with my family!! 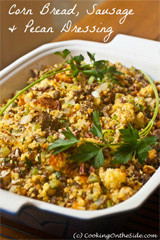 I have been cooking this dish for many years and it is a favorite. It is great as a pasta salad served cold as well. 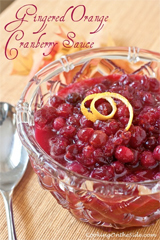 I made this numerous times and received rave reviews! Unfortunately, during several moves, I haven’t been able to find it. This is it!! Thank you! It is a wonderful, wonderful recipe!